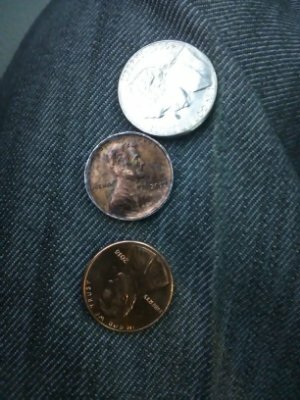 Lincoln 2017 Penny... Or Is It? 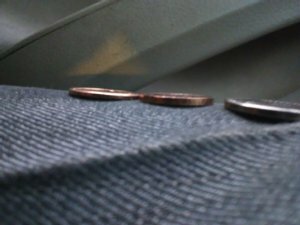 I noticed a penny because of its unusual color it had on it and as I looked at it closer saw that it was about twice as thick as a regular Penny and even thicker than a nickel please check out the pics!anyone have some expertise to offer... Thanks in advance and I appreciate your expertise! What's the weight of your coin? Looks like it was placed on an anvil and the edge was rolled and it widened out the edge a bit. If that is the case the coins diameter should be smaller than a normal cent. Looks altered. 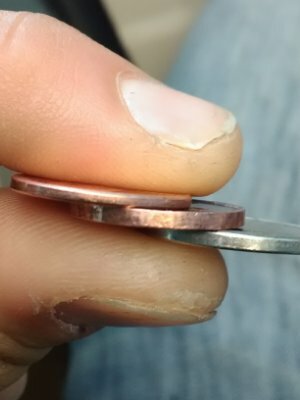 The coin does look smaller than the other cent in the photo. to CCF. Looks altered. PSD. It could be from thicker stock. I have a 2000 P cent that is as thick as a proof cent but it is just thicker stock. No premium for those unfortunately. But I feel yours is not like that. On a dryer coin the metal is folded over the edges. No premium for these either. Just a damaged coin. Could it be an early stage dryer penny? Just another damaged coin. Won't even work in a vending machine.